Heath bars are one of my all-time favorite sweets. Growing up I’d start every family road trip by spending my hard-earned babysitting money on a Heath bar from the first gas station along the way. And by hard-earned, I mean sitting kids in front of the TV while I talked to my BF Brittany about cute Travis from Miller’s Outpost. I felt that same palpable excitement when I opened Flav’s 100mg Cocoa Nibs Dark Chocolate Bar. 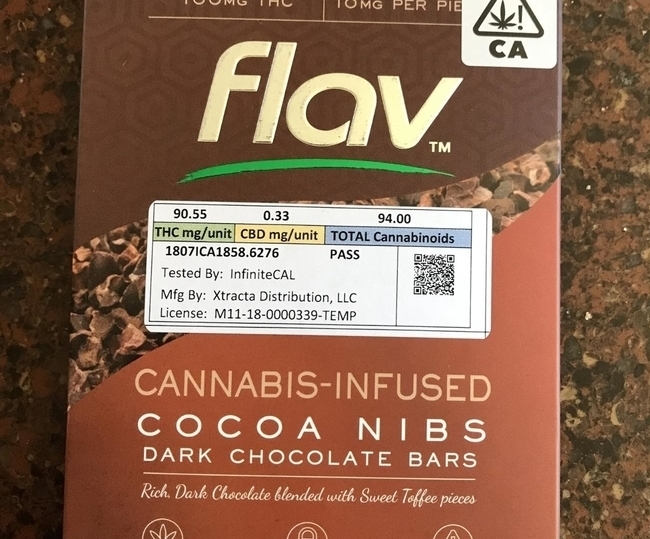 Flav has become a sort of stalwart in the California cannabis market providing quality flower, concentrates, tinctures, topicals and edibles (oh my!). Can these cocoa and toffee nibs live up to my childhood expectations while making me feel another type of excitement? Continue below to discover that and more in this comprehensive review. 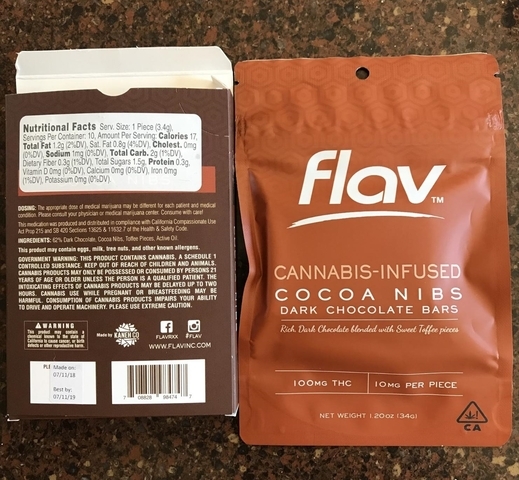 The thick, brown box’s minimal design and lack of eye-popping graphics make it barely noticeable, though a picture of the cocoa nibs and the word “cannabis” are prominent. The labeling hits all the major points and compliance needs: storage technique (something too many edible brands fail to provide), batch number, dosing information, ingredients, nutritional facts, THC and CBD content, total cannabinoids, and a scannable QR code to verify testing results. However, I noticed the bar falls 10mg short with 90.55mg THC and the back says “Made by Kaneh Co.,” another brand. Does Flav provide the flower while Kaneh Co. produces the chocolate? This 100mg Cocoa Nibs bar is made using Flav’s own cannabis, which is cultivated according to the specific needs of each strain. Then the brand utilizes a super clean CO2 extraction method that produces a solvent-free, tasty extract with natural terpenes. When I pull out the chocolate, it’s completely intact, which isn’t always a given (NUG’s 80mg Milk Chocolate Bar was broken before opened). All 10 pieces are very discernible with deep grooves, making it incredibly easy to break or cut. Each is debossed with the Flav logo or 10mg amount, so you know the proper dose; but in this case each piece contains 9.055mg of THC. Every nib is thick and substantial so eating my typical 40mg dose, or four pieces (36.22mg), is enough to satiate my sugar and flavor cravings. It’s like having “The Great British Baking Show” in my mouth. The chocolate itself is creamy and rich but not overpowering. The toffee adds a firm crunch that pairs nicely with the slightly bitter cocoa base, giving it the flavor of my beloved Heath bar but, because it uses cocoa nibs instead of milk chocolate, has a sharper and more refined taste. I can barely notice the cannabis, which doesn’t taste burnt like so many extractions. This sweetness and subtlety make Flav’s chocolate toffee great for many dessert recipes. I could break it over ice cream or add it to batter to make chunky cookies! I’d buy this at my local health food store even if it wasn’t infused with cannabis! And I’d totally share it with Travis (call me). As much as I love the flavor and versatility, I bought this edible for its effects. I took my dose before Disneyland and, after about an hour, I gradually felt my usual body rush. This made standing in line tough since my legs became heavier. I was even close to couch-lock and nearly became a permanent resident of the Haunted Mansion. If you’re looking to get a more immediate and uplifting high, try a different edible. 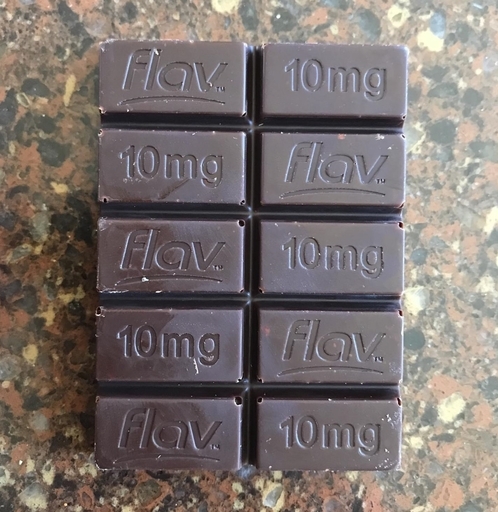 These Flav 100mg cocoa nibs are moderately priced at $18, considering the lower THC content, flavor profile and calming effects. While I’d buy this again because of my Heath bar fixation, you can find a superior infused chocolate like a KIVA bar that tastes and medicates more effectively for a few dollars more. A minimally designed thin brown cardboard box and a sturdy, child-resistant, resealable bag. Packaging includes a picture cocoa nibs, though it’s just a sliver and difficult to see with the lab testing sticker. Better-than-average labeling that addresses all compliance info and most of my questions. Includes a scannable QR code to verify testing results. Total THC content is 10mg shorter than advertised; back label also says the bar is made by another brand. The bar is divided into clearly marked 10mg servings, but if you need less you’ll need a knife. Dosage warning reminds you to consult your doctor as cannabis affects everyone differently (I love this). Start with one or two bars/pieces then see how you feel after an hour. At first glance and from afar this edible looks like any other dark chocolate bar, but up close stamped the brand name and dosage give it away. Minimal cannabis smell; could be eaten at the office, school or even home without anyone noticing it’s cannabis-infused. If you enjoy dark chocolate with bits of toffee, you’ll love this. I prefer milk chocolate so it was a bit strong for me, but delicious nonetheless. Cannabis is very well hidden, though there was an overly bitter taste after eating a few of cocoa nibs. It’s easy to hold (not too oily or dry) but, in my experience, does melt faster than others. Softness detracts from the smooth, consistent texture so refrigerate or store in a cool, dark place. Having a minimal tolerance for edibles, I started with four bars (about 40mg) to gauge the effects. Felt sedative effects after about an hour; very calming and relaxing. My legs grew heavy and heavier; perfect for chilling on the couch or before bed. Not the ideal daytime edible. Extremely versatile since it can be melted down and added to a variety of dessert recipes. Eat it solo, dip in peanut butter, add to S’mores, crumble/shave on ice cream, blend in a milkshake–get creative! Out of the three packages I purchased, these nibs were very similar if not identical in size and taste. Potency differed; the second batch felt much less potent, leaving me to assume not every package is as strong as advertised. If you’re new to cannabis, it’s appropriately priced at $18 a bar considering the dosage/cannabinoid content, ingredients, packaging and effects. If you have a high tolerance or consume edibles daily, it’s too much for too little. While this bar is good, it doesn’t stand out against others in terms of taste and effect. The 100mg Flav Cocoa Nibs Dark Chocolate Bar’s creamy outside, slightly bitter cocoa taste and crunchy toffee center bring me back to my childhood obsession with Heath bars–and Travis from Miller’s Outpost (call me). Only this one looks a bit more gourmet than cannabis cocoa and produces a mellow high that might keep you glued to your seat. If you eat edibles frequently, the price and missing 10mg could be a deal breaker, though it’s simplicity and labeled pieces are great for newbies who want a more familiar entry into edibles.